HOME OFFICE is designed to be a waterfront office or a home afloat as the owner may require. I think she will appeal to many small business individuals who are operating from a small home office. She will work well as office space at the owner's waterfront pier, with their favorite yacht tied nearby. 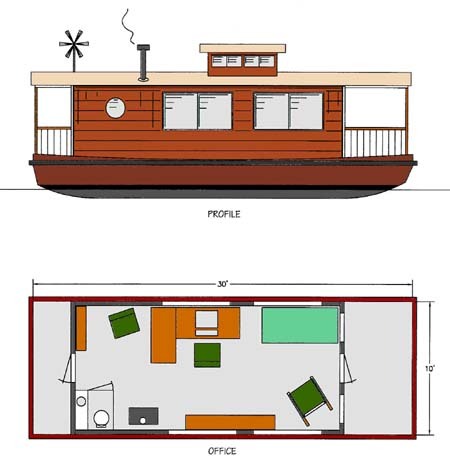 The HOME OFFICE is of course convertible to a floating home, second home or retreat. Her hull is built of plywood and epoxy. The house is framed and sheathed in lapped cedar siding. The top is tongue and groove over laminated beams covered with a layer of plywood and fiberglass. Simple paint finished trim will give her a warm cottage appearance. She will be easy to build and very inexpensive waterfront office space or floating cottage. Estimated cost for quality construction materials is $4 to $6 per pound. This cost includes a high level of outfit and finish you can be proud of after putting the effort into building this fine boat. Purchase Construction Plans for the HOME OFFICE for $420.00 for delivery by US Postal Service.